In the midst of the challenging startup, UF Online had to deal with the premature departure of the initial executive director. After a one-year search process, UF Online chose a new leader who has absolutely no experience in online education. That was probably the fifth edit of a paragraph that started closer to "UF Online somehow thought a bureaucrat from EPA should be its new leader. Next up: filling the VP of student support with DMV veteran." I was wrong - it turns out that choosing an outsider was just what the program needed. At this point, it might have been worth stepping back and challenging some of the original assumptions. By late 2016, however, I noted a "remarkable transformation at UF Online" and how the unit shed the hubris of the initial plans and really did challenged original assumptions and came up with a new strategy. At another WCET session, this same UF Online executive director Evie Cummings provided more insight into the mindset that led to this transformation. Prior to coming to UF Online, Cummings was instrumental in creating and establishing the EPA Information Quality Guidelines and much of the focus was on transparency and accuracy of information shared with the public. This mindset has been brought to the University of Florida, not only leading to an honest reevaluation of original assumptions but also to what I consider exemplary public reporting on program and student outcomes at UF Online. Another mindset described in the session was the acceptance of those who control funding - board of governors and state legislators in this case - and figuring out how to use data and communication to bring them along into healthier decision-making. These approaches are evident in the UF Online annual report released earlier in the week. In terms of enrollment, UF Online not only reports current status and plans, but they choose not to whitewash the past. Their report shows the original plan, the revised plan, and current results with a healthy 34% year-over-year enrollment growth. One side benefit - I no longer need to update the spreadsheet I had been using to describe the same information. Further in the report, there is a description of UF Online's new emphasis on creating community among online students and graduates. Launched in 2017, the UF Online Connections Program works to foster a thriving learning community across all online students, faculty, academic advisors, and staff. Coupled with strong academic programs, a vibrant and engaged online student experience assures UF Online students not only gain the skills they need but also the connections and network to support them after they graduate. This past year, the Connections program emphasized providing community and networking opportunities with key strategic in-person events. They have also launched what they call UF Plaza, a virtual campus to help create social engagement, peer collaboration, and general support groups. Structures outside of the classroom focused on helping online students feel connected. One of my previous criticisms was the creation of Pathway to Campus Enrollment (PaCE) - automatic enrollment offers for qualified students who did not get into the main University of Florida as traditional students, with option to transition from online to campus for upper division coursework. When PaCE kicked off, the effort seemed focused mostly on institutional rather than student needs, and students were unprepared for the offer and decision. There was no provision to explain the program and help students decide if they should consider the online option. This consists of a full day of informational sessions followed by one-on-one sessions with an advisor and concluding with first semester registration. We Come to You help sessions: For the first time, in March 2017, UF provided a local site visit in Coral Gables, FL to answer questions about PaCE and help students and their families to make an informed decision. 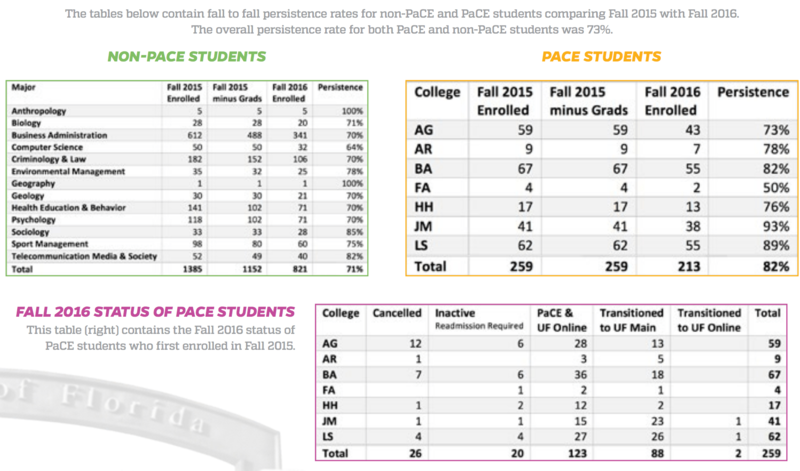 Given that PaCE students are a different group - they did not initially apply to be an online student - it makes sense that UF Online now reports fall-to-fall persistence data for non-PaCE and PaCE student groups. And they even give a breakdown by academic program and updated status of the PaCE students who enrolled in 2015. 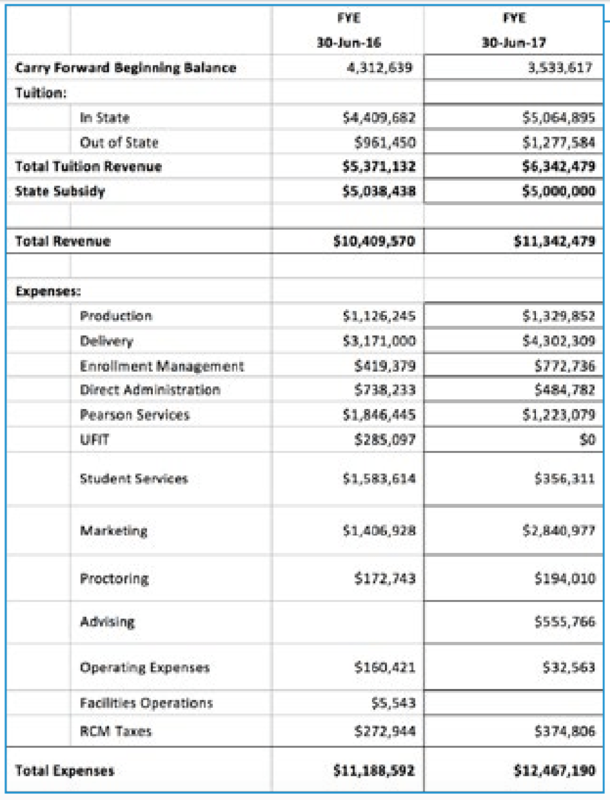 There are also detailed financials, showing that UF Online is currently bringing in $6.3 m of tuition revenue and $5.0 m of state subsidies and spending $12.5 m.
UF Online still has challenges - improving persistence rates, getting to break-even financials, etc. And they are not the only online program with this level of success. What makes UF Online so interesting to watch is that they made some hard choices to get past faulty original planning assumptions, they are very transparent in sharing their information publicly, and this is a very positive case of higher education embracing and learning from an outsider.